2001, Glass, Paper Pulp & Wire, 78.7" x118" x 98.4"
Clouds in the Water No. 12 2002, Glass, Paper Pulp & Wire, 23.6" x 19.7" x 39.4"
(c) Art Touch Collection, LLC 1997-2008. All rights reserved. Images of contemporary Chinese art and modern japanese art print on this web site may not be reproduced without prior permission of Art touch collection or the artist. In the realm of print making, there is no limit for technique and the media is ever evolving. I have endlessly researched and analyzed the characteristics of woodcut, etching, lithograph and screen prints and infused the vocabulary of painting in the creation of my prints, knowing that technology is not the ultimate tool of creativity, but rather the origin for the fountain of creativity. I believe that the presentation of an artwork should be based on the harmony of the beings and fusion of the elements. I see the markings left by the trace of time everywhere in the nature. It is like when I see a grain of sand, I fantasize the world; and when I see a flower, I fantasize the paradise. Whether the grain is small or big, both are sand. Small grain looks like big grain when it is magnified, giving the illusion of mountain, river or island. Small flower looks like big flower when it is magnified, giving the illusion of shrub or cloud. On the other hand, the mountain, the river and the cloud will become a small grain of sand or a small flower after they are eroded. Therefore, every being in the universe co-exists with and is related to other beings, hence the life cycle. In the end, all beings are one, but also not one. Every being is constantly looking for new trace. As a result, the scientists are searching daily for new order and the artists are constantly predicting the new trace of the future. I try to project my creativity in concepts of small and big, simple and complex, real and imaginary. I also try to transform the 2-dimensional prints into a 3-dimensional print. Viewing prints and sculptures is actually a very similar experience. Both can be re-produced to give multiple personalities. 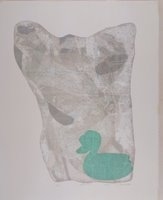 To enrich the element and to expand the spatial of the print, I paste the finished prints over a 3-dimensional structure made from paper pulp. 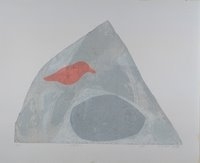 A dialog between the paper pulp and the design on the print is therefore formed through the contrast of the textures. I have also tried to transfer the design of the print onto the surface of glass, and then use the heat to fuse the image in the glass. Through fire, I achieve the quality of water and the design is like floating in the water. It is this game of space and time that intrigues me to create.